The Northern Ireland Environment Agency (NIEA) will once again be hosting the annual International Bog Day event at Peatlands Park, near Dungannon to celebrate the importance and beauty of bogs. The day also includes the Northern Ireland Bog Snorkelling Championships which attracts competitors from all over Ireland. There is lot’s to do, things to visit, shops to visit, Museum to see, Beaches, or just chilling out..
From there you can then select the Northern Irish Tourist Board Or the Southern Irish Tourist Board. At http://www.discovernorthernireland.com/journey there is contest to win a week end away in Northern Ireland every month, so why not put your name in, someone has to win it! Once you have the Free travel pass, there are other attractions you can go to/visit that are free too, so don’t delay, get that pass today! Today is Friday, and The Oxegen Festival is just around the corner.. Though we have had some beautiful weather and one was starting to think it was going to be sunscreen and sunhats this year, unless the weather magically changes, it looks like we’re back to all too familiar wellies and raingear. So what is this Festival all about? Ireland’s Oxegen Festival is always one of the can’t-be-beat best concerts in Northern Europe, and 2010’s lineup isn’t set yet, but you can bet it’ll be set to sizzle Dublin with over 100 acts and 80,000 rockers at this sells-out-fast event featuring confirmed concerts from Jay Z, Muze, Black Eyed Peas, Eminem, Kasabian, Florence and the Machine, Stereophonics, Paolo Nutini and Faithless. Last year’s lineup included Bloc Party, Elbow, Razorlight, Kings of Leon, TV on the Radio (love ’em), Yeah Yeah Yeahs, Manic Street Preachers, oldies but greaties like Jane’s Addiction, Nine Inch Nails and the Pet Shop Boys (the latter two were also at other European concerts last summer, and you’ll see similar duplication this year) and there will be, as they say, so much more. 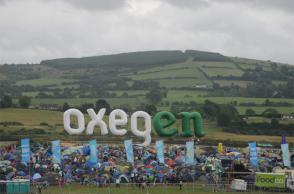 The Oxegen Festival is July 9-11 in 2010. Overnight camping at Punchestown Racecourse, Naas, County Kildare for those doing the entire weekend of the Oxegen Festival (and everyone does) opens at noon on Thursday, July 8, and closes at 6:00 p.m. on Monday, July 12. Oxegen Festival ticket prices haven’t changed since 2008 and are €224.50 total for three days of music *and* overnight camping (yes, camping is included). For €20 more, buy a four-day ticket to start the music festival fun on Thursday and camp that night, too.